The aim of this post isn’t to add to the already overwhelming evidence for clay as an important ‘companion’ substance – to extend Donna Haraway’s companion species – that has profoundly shaped (and taken shape within) human ways of life. My research focuses on the work of visual artists – sculptors – that work with this material. Working alongside them as an assistant, making work in studios, galleries, museums and forests, I gradually got to know the rhythm and feel of their practice; a sense of the materials they worked with and the tools, equipment and techniques they used, and followed the move from studio to gallery and how artists engaged with, and sold their work to, galleries, collectors, curators, museums, commissioning institutions, funding bodies, and a wider audience of journalists, critics and peers. Rather than ethnography, this essay takes a more speculative, personal approach to clay in order to try and articulate something of its distinctiveness as a substance. I consider two sides of this distinctiveness: clay’s plasticity and its metamorphosis through fire. We know nothing about a body until we know what it can do, in other words, what its affects are, how they can or cannot enter into composition with other affects, with the affects of another body, either to destroy that body or be destroyed by it, either to exchange actions and passions with it or to join with it in composing a more powerful body. In 2013, I worked with the sculptor and ceramic artist Alexandra Engelfriet on a series of projects, including a performance with the musician Ab Baars at the Briqueterie museum in Ciry-le-Noble in the Burgundy region of France. For 10 days we worked to turn 25 tonnes of clay, delivered directly from the quarry in nearby Saint-Amand-en-Puisaye, into workable clay. With the help of a revolving cast of helpers, Alexandra and I would tread and knead through the clay, slowly working the water into its body. The clay gradually changed in texture from dry chalk, through lumpy cottage cheese, to a heavy paste. Every morning would take an act of will to overcome my reluctance to take the first step into the clay, to get bogged down in its viscosity, its way of turning my every movement against itself. For Gaston Bachelard, this viscosity marks the ‘innate offensiveness’ of mud, its ability to unhand or, rather, unfoot those unfortunate enough to fall in its snare. But on the last day of the clay’s pressing, the clay underwent its final transformation: from a thick paste, earth and water seemed suddenly to emulsify, to turn fatty and unctuous, slippery instead of sticky, both wonderfully yielding and playfully resistant in its yielding. In the right balance with water, clay becomes what Bachelard calls pȃte: the ‘perfect earthen matter’. Its plasticity marks the exquisite point between the too hard or too soft, awakening a ‘dynamic and profound participation that is truly the joy of the hands in the material sense’. As pȃte, clay invites play, it invites the ‘dynamic coupling’ of material, hand and head, which, for Lambros Malafouris, marks the relational achievement of ‘material agency’ that serves as a bridge between a ‘plastic mind’ and ‘plastic culture’. I’d spent these last days knee, sometimes thigh, deep in clay but this was the first time I moved into the clay with my whole body, a wary hesitation caught between threat and invitation. Playing with the mud, with the sensation of my body against the mud, the way movement and touch, doing and undergoing, alternated together, there seemed no end to the possibilities this pȃte afforded. The unnerving, joyous sensuality of the experience wasn’t exactly sexual but that would be the nearest approximation to the measure of desire and delight, with its underbelly of disgust and fear, with which it was filled for me. Over the months of fieldwork with Alexandra and others artists, I’d got a measure of clay’s materiality; a sense of its different textures, movements and smells, a sense of the possibilities different clays afforded my hands, heart and eyes. But for a moment that afternoon, it felt as there might be no end to the process of opening up into the clay; no end to what it was possible to do and undergo with it; a strange moment of vertigo in which I seemed to be falling both into the clay and into myself. The remarkable plasticity of clay underlies much of its co-option within the everyday, and not so everyday, life of people around the world, in the ‘focused action’ of making pots, figurines, tokens, ovens, houses, mosques. The temptation within a discipline like anthropology is to focus on this ‘empirical’ evidence of everyday social life, to circumscribe the qualities, the materiality of substances, ‘by virtue of their incorporation into a characteristic pattern of day-to-day activities’. But, with Bachelard, I’m interested in how a ‘literary imagination’ can provide a speculative, intensive description of experience that goes beyond the purely empirical or pragmatic, in order to divine and evoke in words the fullness and fleetingness of the felt sense of working with materials. Not just the doing with clay but the undergoing, the sense of being overwhelmed and taken possession of by this substance and the dreams with which it populates experience. The transformation of clay from soft sediment to stone is the work of fire; more specifically, the work of fire at the intensity made possible by the pyrotechnology of the kiln. This metamorphosis marks the other side of clay’s distinctiveness; the siren call of the insensible. The earliest ceramics unearthed, in caves near the village of Dolní Věstonice in the Czech Republic, have been dated to around 26,000 years ago. Fragments of thousands of figurines of animals and humans litter the site near the kiln in which they were fired. On the basis of their experiments the researchers believe that the ancient artisans fired the clay objects whilst still wet, and the entire procedure was designed to thermally shock the items, causing them to steam, sizzle, and explode, perhaps for ritual or divinatory purposes. In the fierce heat of the kiln, water turns to steam, its expansion violently cracking the clay it finds itself in; but this intense heat also transforms the clay into ceramic. From the archaeological evidence, it seems these ancient ‘artisans’ didn’t develop any further use for this new material. This find pre-dates by many thousands of years the first evidence of pottery, the earliest obviously ‘functional’ use of this new material. In the obscurity of their purpose, these figurine-fragments seem to thumb their nose at the usefulness of pots and bricks, and the place this usefulness has held in theories explaining the origins of ceramic technology, and bear mute witness to the magnetic power of transmutation itself, the riddle it poses to prospective sense and sensibility, to imagination and understanding, to the process of knowing. In the transformation into ceramic, clay is given over to fire. Concealed in the flames, this metamorphosis takes place out of reach of sensible perception. This interval sets into tension the relation between a before (the fire) and its after. Opening a kiln is a moment full of anxiety: what will the journey through the fire have done to objects once familiar to the hands and heart that made them? This anxiety is the measure of the uncertainty, the indeterminacy, of change. Holding a bowl, still warm from its passage through the fire, up to the light to catch the play of color and texture on its surface is to come face to face with a riddle. 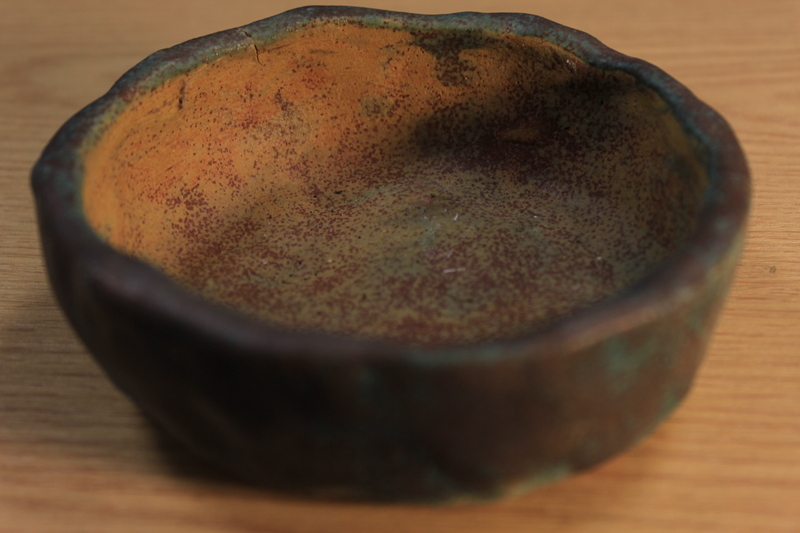 This little bowl was the first I fired during my fieldwork with the sculptor Douglas White, a little experiment that turned out surprisingly nicely. I’ve tried on a number of occasions to recreate the russets of the nickel and iron glaze on the inside, but have failed every time. Not knowing any better, I jotted down the vaguest of recipes, leaving out so many details of its making, that in their absence have proved to be vitally important. The riddle posed by clay’s metamorphosis into ceramic is how to ensure the return of its unexpected gifts. I had joined Douglas during his residency at the Europees Keramisch Werkcentrum (EKWC), a research institution in ‘s-Hertogenbosch in the south of the Netherlands. 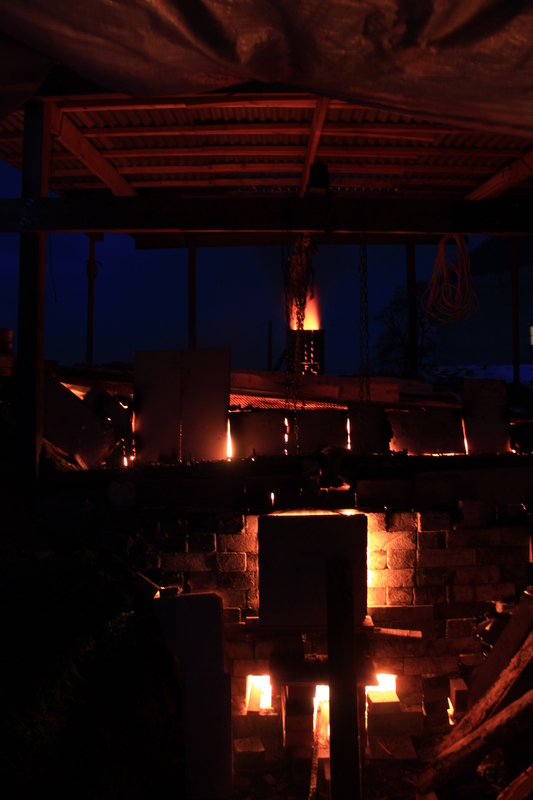 We were there to learn about working with clay and fire, to learn from the ceramic tradition. EKWC embodies – in its architecture, its electric and gas kilns, its equipment, its meticulous sourcing, storage and labeling of materials, the knowledge and curiosity of its technician-staff – a community of practice orientated towards making sense, and making certain, of this material and its transformations. In the productive uncertainty of its transformations through fire, clay invites and repays this attention; it reframes materials, and the processes of their extraction, processing and mixture, as open questions. We know nothing about a body until we know what it can do, through patient work of trial and error, improvisation and careful observation, inculcating a metabolic sensibility to the world of materials that draws attention to ‘the often forgotten but massive effects of man’s re-shaping of earthly materials by fire’. The genealogy of the art of ceramics, and its close association with chemistry and material science, tends to naturalize a technical attitude that foregrounds an ‘objective’ vocabulary purified of sensibility, feeling, imagination, meaning and value. But as Pierre Gosselain, in his reflection on the ceramic traditions of sub-Saharan Africa, argues, the technical work of ‘making pottery’ cannot easily be disentangled from the sensible and symbolic work of ‘making sense’. In the indeterminacy of its transformation through fire, clay invites creative, practical speculation on the principles of change itself, taking form shape within different cosmologies and ways of life. This post has been an attempt to get a handle on this extraordinary substance I’ve been working with over the last three years. The qualities of plasticity and metabolic fecundity have been ways with which to think through the difference clay makes or, rather, the ways in which this substance shapes our (my) ways of making sense of it, of making sense with it. The plasticity of clay draws us out into the fullness of sensibility; its gift of ‘dynamic coupling’, originating in the correspondence between the kinesthetic sensibility of the body and the kinetic response afforded by this substance, underwriting the richness and diversity of cultural forms clay has assumed. Through this gift of material plasticity, clay has been woven into the plasticity – the open-ended, divergent nature – of human ways of life the world over. In the indeterminacy of its metamorphosis through fire, clay leads imagination and practice by the hand beyond the ‘science of the concrete’ to engage with materials as active co-constituents of a world-in-formation beyond the directly perceptible. 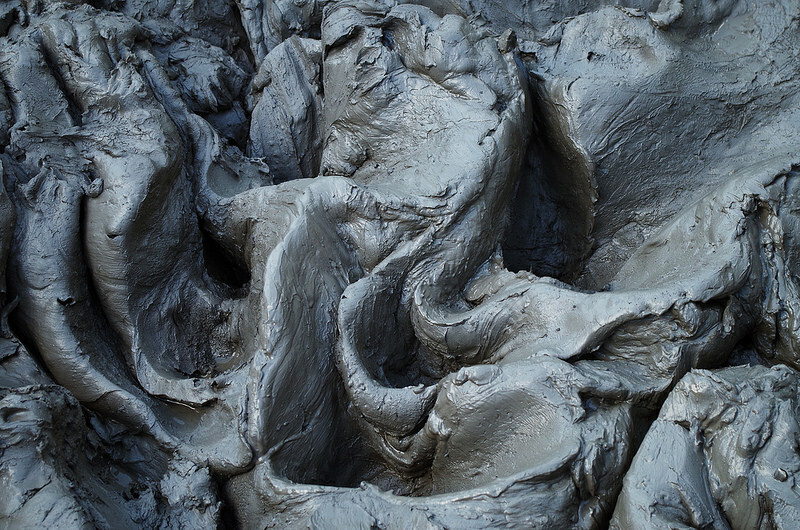 In its relation with fire, clay has been a partner in its dissolution as a stable, tangible substance within the ongoing experimentation in ‘material-discursive practices’ its open-ended transformations inspire – of which contemporary ceramic tradition in Europe is but one of its many divergent offspring. Marc Higgin’s current ESRC-funded PhD research focuses on contemporary art as a way of thinking through theories of making and knowledge and material culture – all which are central to anthropology’s project of trying to understand the possibilities of human ways of being in the world. His previous research focused on human-animal relations; developing the MRC/ESRC-funded inter-disciplinary network ‘Understanding Individual Behaviour through human/animal relations’), research into farm animal production as part of EU-funded Welfare Quality and DIALREL projects, and work on guide dog partnerships in the UK. My current research focuses on the practices of contemporary artists as a way of thinking through theories of making, knowledge and material culture. I worked – in the ‘field’ – as an assistant for the sculptors Alexandra Engelfriet and Douglas White, following the diverse processes and contexts through which raw materials were transformed into works of art. Deleuze, Gilles and Guattari Félix. A Thousand Plateaus: Capitalism and Schizophrenia. London: Athlone Press, 1988: 257. Bachelard, Gaston. Earth and reveries of will: an essays on the imagination of matter. Dallas: Dallas Institute of Humanities and Culture, 2002: 1947. Willerslev, Rane. Frazer strikes back from the armchair: a new search for the animist soul, Journal of the Royal Anthropological Institute, 2011, 17(3), 504-526. Ingold, Tim. The perception of the environment: essays on livelihood, dwelling and skill. London: Routledge, 2000: 168. Rice, Prudence. On the Origins of Pottery, Journal of archaeological method and theory, 1999, 6(1), 1-54. Gosselain, Pierre. In pots we trust: the processing of clay and symbols in sub-Saharan Africa, Journal of Material Culture, 1999, 4(2): 205-229. Ingold, Tim. Being Alive: Essay on Movement, Knowledge and Description. Oxford: Routledge, 2011. Lévi-Strauss, Claude. Savage Minds. Chicago: University of Chicago Press, 1966. Ingold, Tim. Making: anthropology, archaeology, art and architecture. Oxford: Routledge, 2014: 28.